I prepared myself for a grizzly encounter. I planned. While hiking, I would make plenty of noise, clapping, talking, and having my pepper spray in-hand (though you have to be 16 feet from the bear to use the spray…uhmm…wow…really?…yikes). More importantly, I had griz-photos all pre-determined in my head, imagining paintings of huge Alaskan brown bears, swishing around in violent rivers, sleek salmon in their massive mouths. Alaska. I’d never been before. Growing up in Colorado, I thought it would be same-same. Just bigger and colder. Not so. 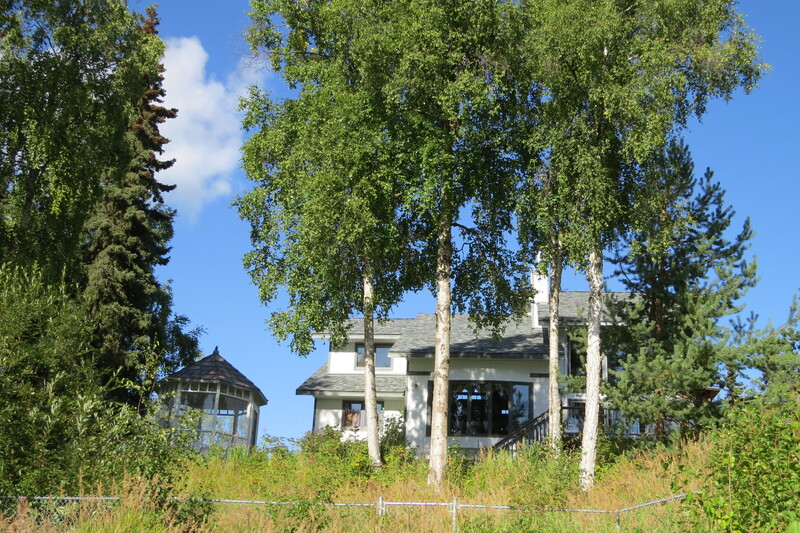 Back view of the house we rented on the Kenai River. 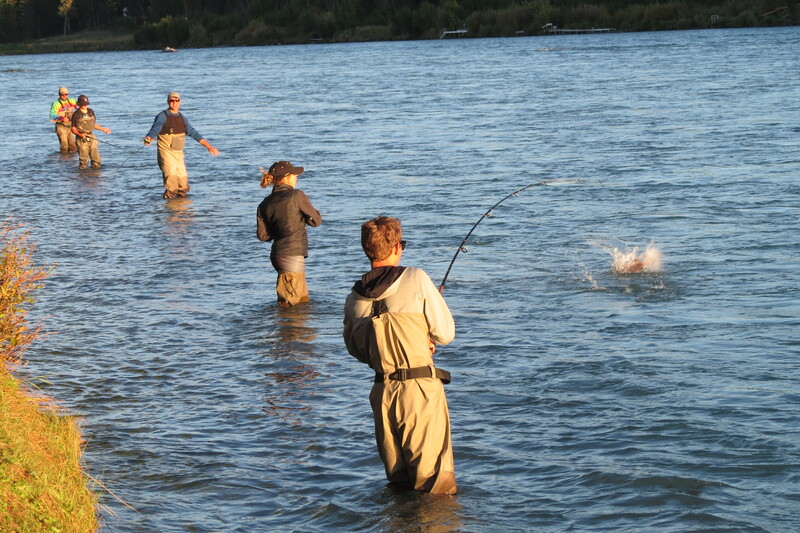 Most of our crew of 11 people fished every day, sometimes all day long! 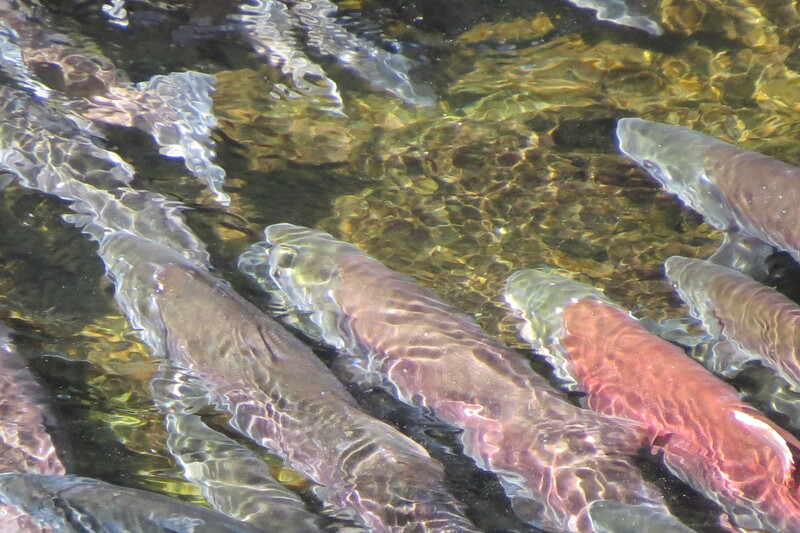 They could fish directly on the Kenai, just a few yards down a path from the house. 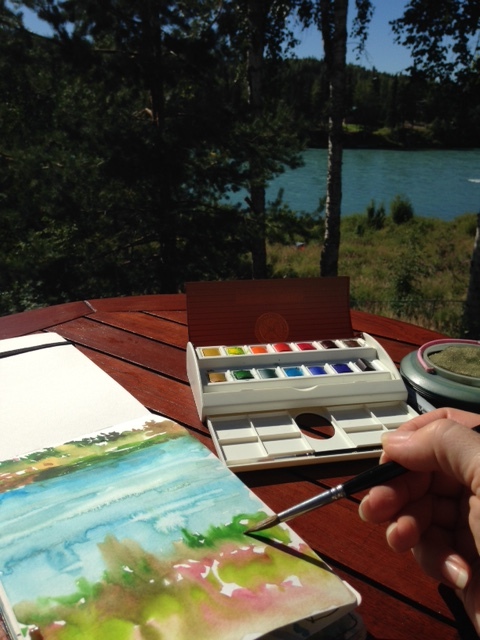 While my family and friends fished, I painted in my journal, enjoying sunny, warm weather. On one particularly sunny day, a nuthatch flew into the house through the open door and ended up confused, flying into a window with a clonk. I threw a shirt over him and took him outdoors. 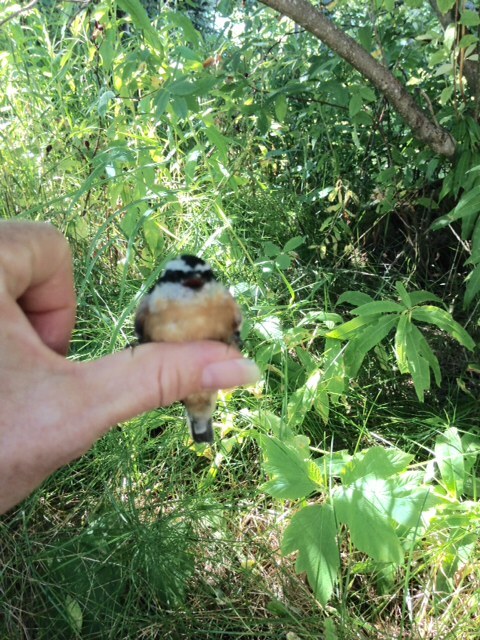 He wobbled around a bit, sat on my thumb until he was mindful, and took off. Poor little nuthatch on my thumb. Cute, isn’t he? In spite of the amazing fishing and the nuthatch encounter, I had my mind focused on bears, scared though I was with the prospect of an actual teeth-slobbering, claws-slashing encounter. BUT! Never, ever let anything come between a woman and her vision of a great painting. Even big brown scary bears. Even that. 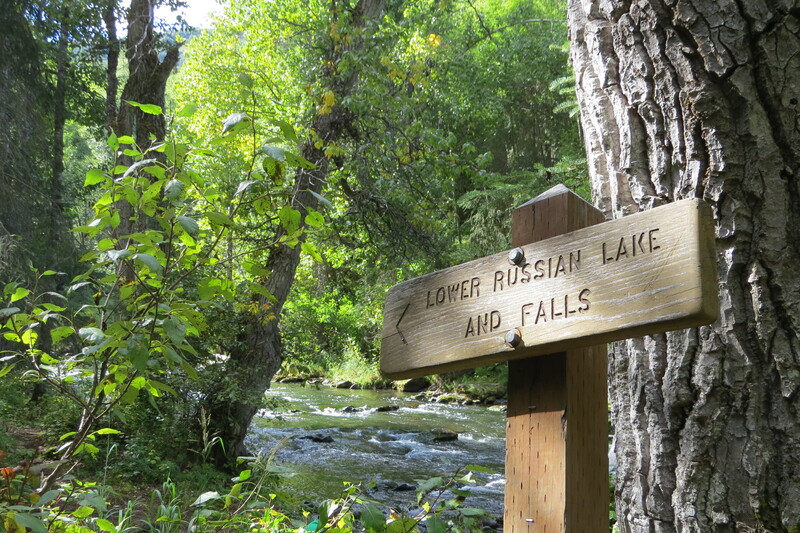 We planned a hike to Russian River Falls, which is known for bear activity. Specifically, bears fishing. We headed back after a lunch of sandwiches and tangerines by the falls. 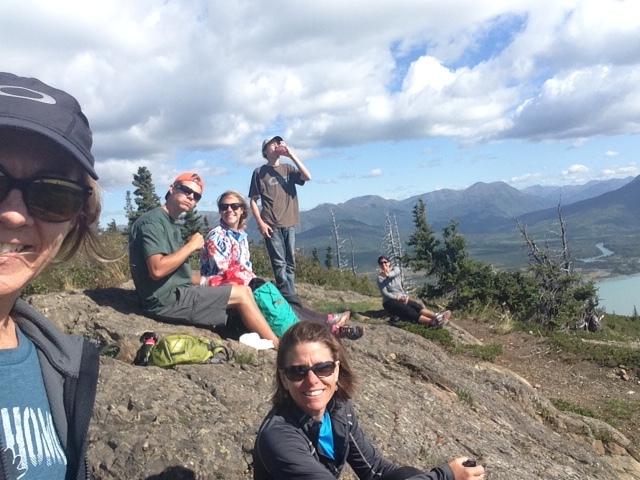 We all had plenty of chances to take photos of amazing Alaskan terrain. You can bet I found plenty of subjects for future paintings. On our way back, we met up with a friendly Fish & Wildlife guy, who offered to take us up to see the fish dam (or weir, as he called it), near Lower Russian Lake, where they count salmon on a daily basis. Wonderful! He was a trove of information on the fauna, and even the flora of the area. We arrived at the lake…gorgeous! Wonderful hike. I would love to spend time in one of the lake cabins that the F&W guy mentioned, painting and hiking the area every day. Maybe I would even become a bear-whisperer. One day, in spite of some major vehicular problems in which we spent all morning at the dealership then ended up renting a HOT Dodge Charger…(hello power, and welcome! 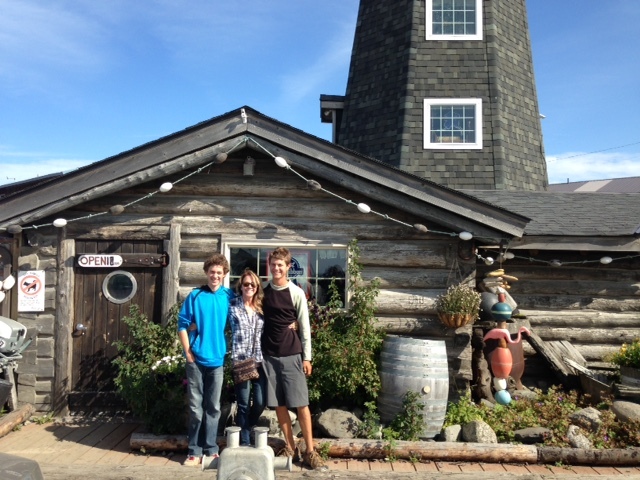 ), we drove to Homer. Beautiful Homer. It featured a long spit on which rested the famed Salty Dawg Saloon (of course, we had to pose in front of it) as well as cute little tourist shops. 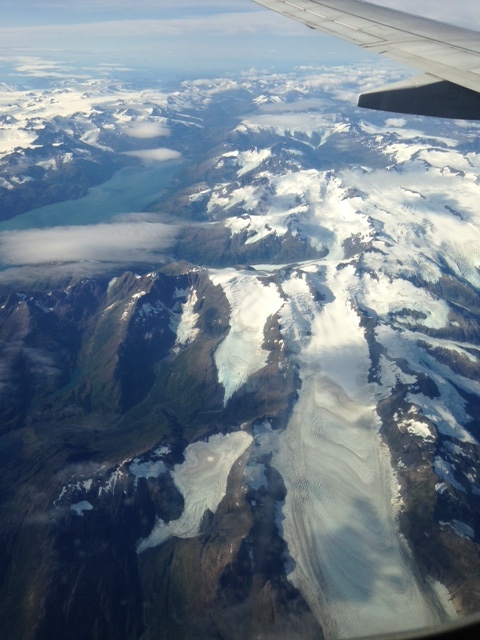 Glacial-formed mountains swung steeply down into Kachemak Bay, providing shelter for many seabirds in its wind-swept waters. Stunning. The next day, we decided another hike was in order. 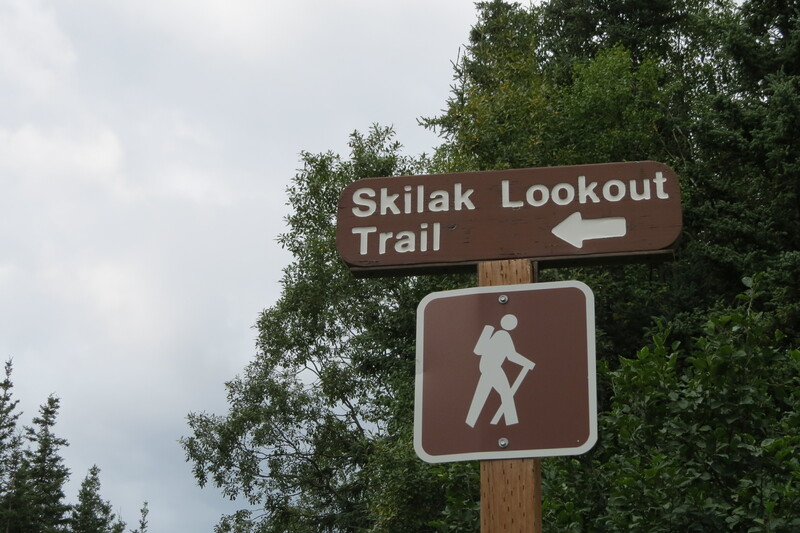 This one, called Skilak Lookout trail, promised incredible views of Skilak Lake. Everyone performed back-bends to get 11 people to their different needs and locations with one car this day, having returned the rental. This trail was a little more sketchy than the other, being less used, more brushy, and in serious bear country. At one point, I heard a very deep moan-groan (no, it wasn’t me) that was “something” (“something” being an inside joke that family members from the trip will enjoy…). That “something” was probably a moose, we decided later, as we had fresh tracks all the way up to the lookout. At the time, though, we considered the very real possibility it could be a bear, and were on hyper-alert, our bear-spray warriors in the front and the back of our group, thumbs on triggers. Amazing, amazing views. The guides online and at the trail site were a little confusing. Online, the hike was supposed to be 2.5 miles round-trip. Turns out, it was 2.5 miles in, 2.5 out. No big deal for any of us, but took longer than what we had planned. No bears(sad face). Bonus, though! 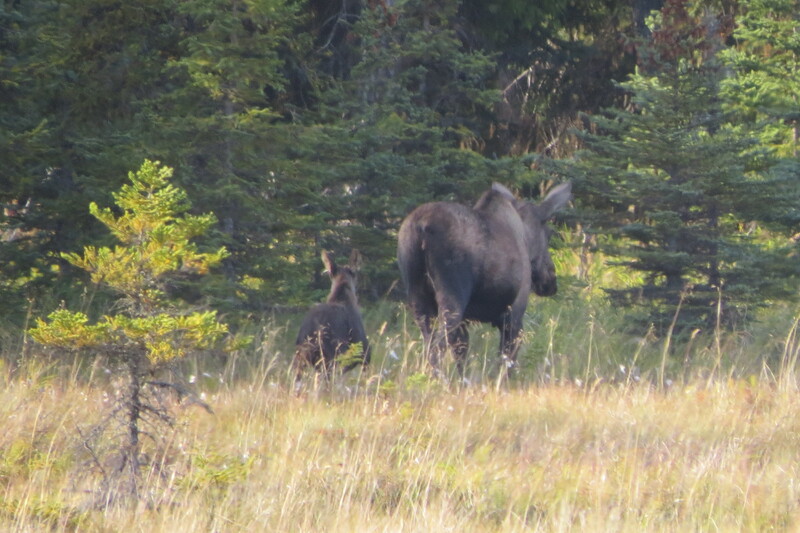 On our way home, we spotted a moose! Alas, we had to pack up and go home eventually. No bear sightings! I still cannot believe it! My visions of superb paintings of bears must be shelved! 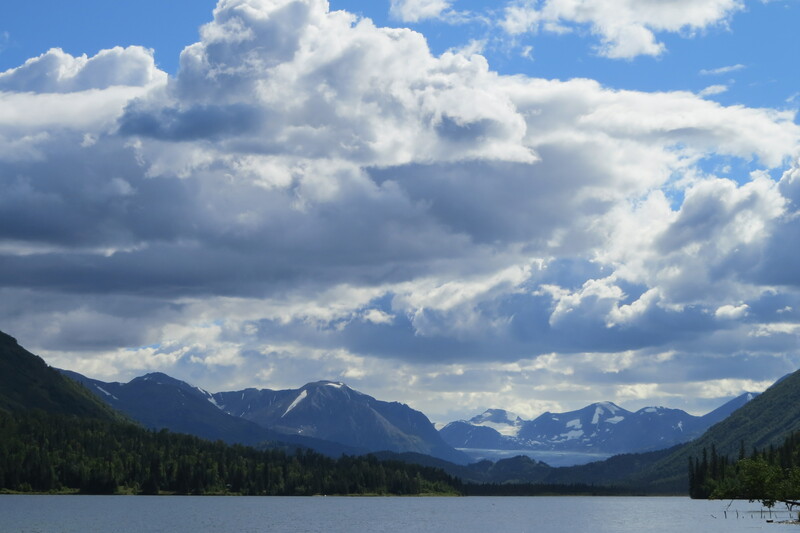 I took many photos, though, and have paintings planned and canvases primed to convey to you my impressions of Alaska. Also? 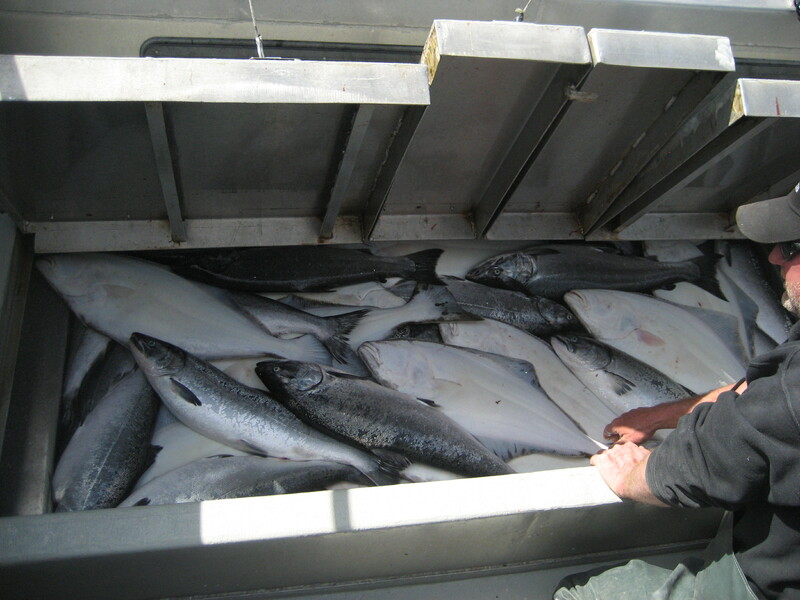 We had around 250 pounds of fish to take home and put into our freezers. Yum. Thanks, fishermen!! Alaska. Bigger than Colorado indeed, but also more wild, more rugged, more extreme and wayyyy less tamed. Ohhh how I miss this beautiful place! Hi, Anna! Yes, it is absolutely incredible. I think I could live there…in the summer. 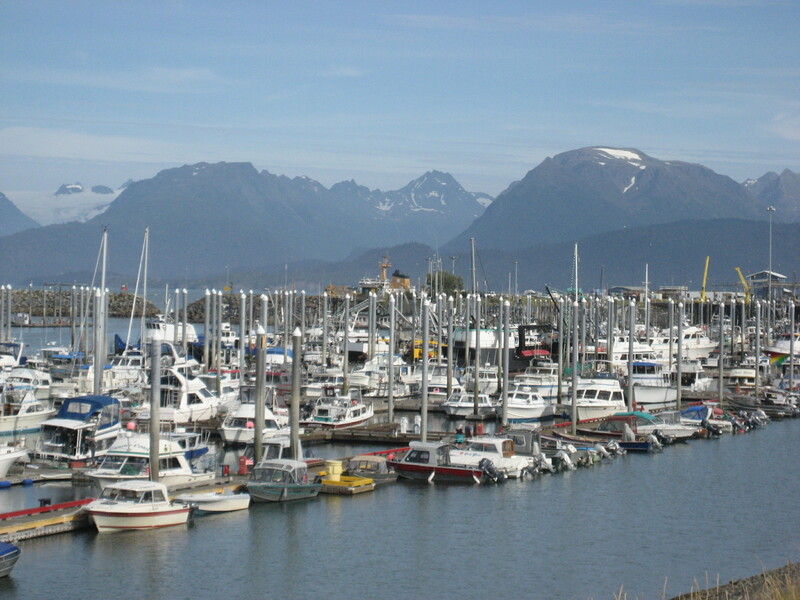 Did you live in Alaska? Sadly I was in Alaska just for a week last summer. I could live there too …probably even for the winter(just one) as I love the cold and haven’t yet experienced bitter cold. Ya true, a week is not at all enough! I so wanted to stay longer …will go again for sure, once in winter too, to watch nature’s light show – Aurora Borealis. But yes we managed to see some Grizzlies, not fishing but clamming. 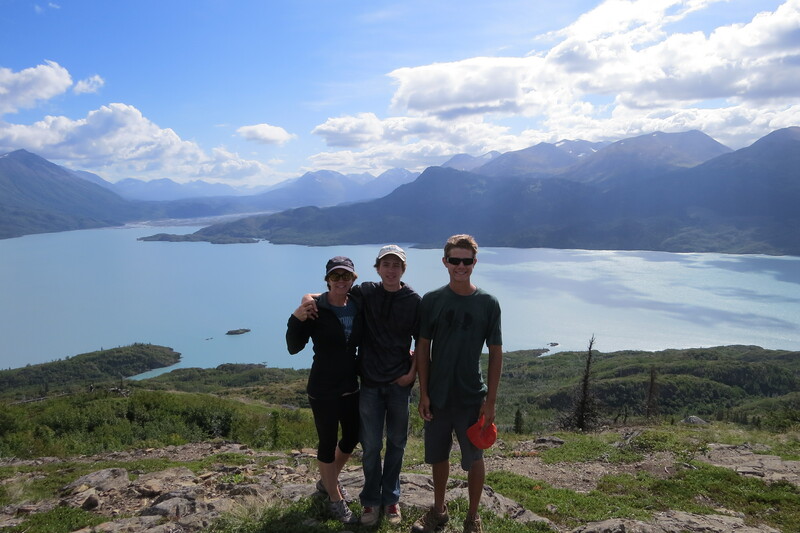 I have a post about my Alaska trip. That must have been amazing. I’ll look for your Alaska trip post.